COLOR GUARD IS CONSIDERED THE SPORT OF THE ARTS! The Eagle Band Color Guard is a group of student performers that performs with the marching band during their halftime shows in the Fall. Color Guard members spin flags, rifles, sabers, and dance to visually enhance the music of the marching band's show by adding color and character to the performance. Color Guard meets for class during 7th period as well as outside of class for rehearsal. 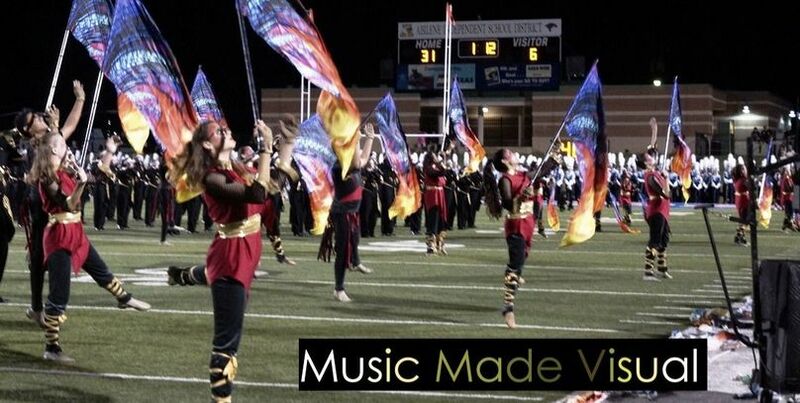 Unlike Color Guard, Winter Guard does not perform with the band, but to a recording. The show has a theme that is reflected through the music, flag, uniform, and floor design. The show includes dance, flag, saber, and rifle work. The Winter Guard performs at the spring show in May and is an active unit in Regional AA Class for the North Texas Color Guard Association (NTCA) Circuit. Winter Guard performances are held inside on a large gym floor. Winter Guard auditions take place in November each year. There is only one Winter Guard at AHS. DO NOT WEAR: JEWELRY OR NAIL POLISH. Payments not made online through CHARMS must be placed in an envelope. If using CHARMS money, please type up a letter to the band boosters explaining your intentions to do so and put it in an envelope. All envelopes should be placed in the Black Mailbox located in the AHS Band Hall with the following information on the front.